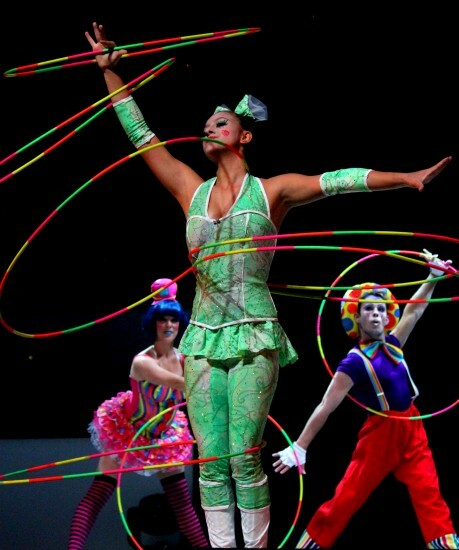 One of the first performances, and a personal favorite of mine, was the hula hoop girl. She seemed to barely move her body and the hoops just glided all around her to the music wherever she wanted them. Wow! At one point, she had so many, it looked like a Slinky! Beautiful and cool. A few of the cast members are kids, and they are fantastic with yo-yo toys and acrobatics. (You can buy the yo-yo toys like they use in the show in the gift shop, too.) There are several Cirque du Soleil style acrobatic acts with long ribbons and trapeze artists that are elegant and seemingly weightless. Speaking of acrobatics, the two men below have an inspiring amount of muscle strength and control. They go through a whole series of gravity-defying poses that you won’t find in any yoga studio. One of the more thrilling performances is the Wheel of Destiny. Imagine two giant hamster wheels connected like a Ferris wheel. Then, two men run inside the wheel, on top of the wheel, blindfolded!, make it go super fast, almost fly off!, and come out okay. It’s totally heart-pounding. The absolute most thrilling act for me, is hands-down the Globe of Death. Good name. Three motorcyclists, yes three – at the same time!, race around in all directions – even upside down! – inside a too-small metal globe. Then, a girl walks in and stands in there while they do it again! I can’t even imagine the focus and choreography that goes into that! I seriously had my hands covering my gaping mouth as I sat mesmerized through the whole thing. Most everyone else did, too. Our 7 yr-old absolutely LOVED Dizzy the clown. He was hysterical! A genius with physical comedy, he acted as emcee and comic relief between acts. Before the performance, he messed with some of the people arriving close to show time (hint: BE EARLY! )… and did some audience participation bits that were super funny. He did this sort of thing in between acts as well and even got audience members to perform on stage! The people were very good sports about it, and again, super funny. 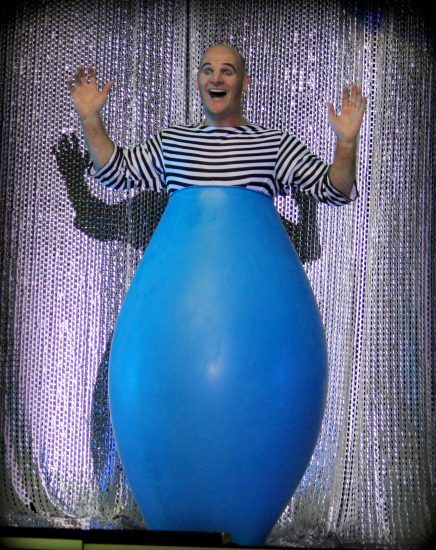 My son’s favorite part was when Dizzy did the balloon bit where he gets inside a giant balloon and jumps around. I can’t even describe how funny this is, but we are still laughing at the memory of it! We were generously hosted to see this performance, and I’ve got to admit, I would have gladly paid over and over again to see it. It was one of the best live stage performances I have seen in any city. What a treat to see it in Myrtle Beach! 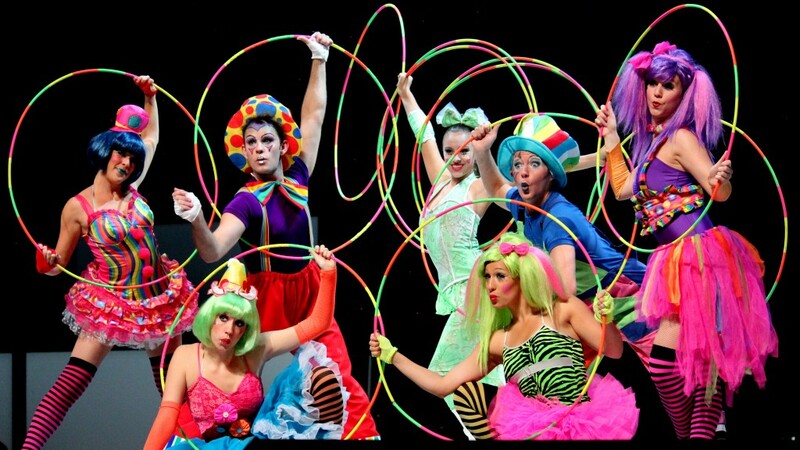 Le Grand Cirque Adrenaline is performing at the Palace Theatre in Myrtle Beach, SC (next to Broadway at the Beach) through Sept. 28, 2012. Order tickets by phone: 1-888-841-2787 or online: http://tickets.palacetheatremyrtlebeach.com. If you need a hotel during your trip to Myrtle Beach, book with us and enjoy our 110% Best Rate Guarantee! every time i come here i am not disappointed. nice post. We just returned from Ocean Beach after a 20 hour car trip home and my family would do it again in a heartbeat. Only we would fly.I had tried to book Seawatch Plantation and was placed at Ocean Blvd. on accident. I was nervous about the mixed reviews that I had read about the place and was very worried that my family would enjoy it. I have a 21, 19 and 17 year old.The place is massive, and when we pulled into the parking garage my heart sank. Security guards directing traffic and no visable parking spaces. We were sent up to check-in and it proved a breeze. Lots of staff, helpful and good at their job.We stayed for a week and could always find a parking spot after check-in day. Sometimes across the street, but never a great problem.The room ( 2 bedroom deluxe in Tower I) was very small but well designed. No space is wasted. The view from our balcony was beautiful. Tower I is the newest Building and has the best pool area. We had requested a lower room and that proved to be a bonus as peak times brought lines at the elevators.The beach and pool areas are well maintained. We didn’t feel crowded on the beach even at high tide and the pool in our courtyard was busy or empty depending on the time of day. The infinity pool is a delight to swim in. The hotubs in our courtyard were not hot or working most of our stay, but it wasn’t an inconvienence for us. Security does a great job at enforcing rules and keeping things running well. The pool bar has a friendly, helpful bartender (Tom) that can give advice on what’s available in the area. Not much without a car, but my family liked just hanging out on the beach or by the pool(s). We used a lot of our timeshare points to be there, but I would recommend it.